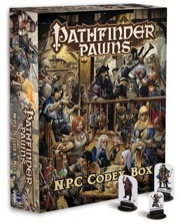 Whether they be vile villains, able allies, or anything in between, the characters of the Pathfinder Roleplaying Game NPC Codex come alive on your tabletop with this box-busting collection of more than 300 character pawns for use with the Pathfinder Roleplaying Game or any tabletop fantasy RPG! Printed on sturdy cardstock, each pawn contains a beautiful full-color image of a character from the NPC Codex, as well as common animal companions, and numerous never-before-illustrated characters. Each cardstock pawn slots into a size-appropriate plastic base, making it easy to use in play alongside traditional metal or plastic miniatures. With multiple pawns of the most useful characters allowing you to create every single encounter from the NPC Codex’s encounter groups appendix, the NPC Codex Box is the best way to ensure you’ve got the right characters to push your Pathfinder campaign to the next level! Cover Art by Wayne Reynolds. 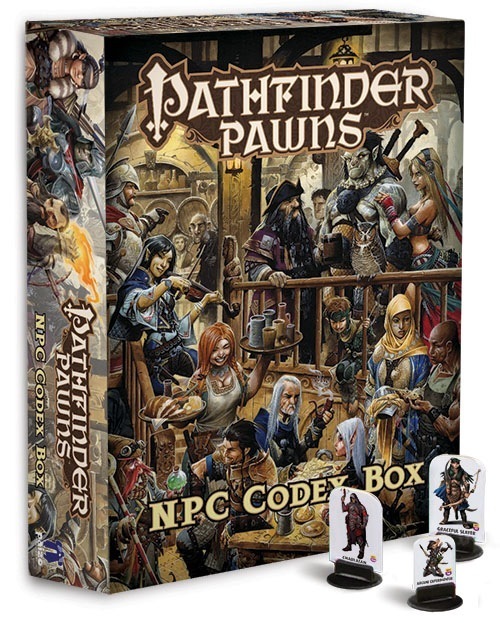 I have always loved the idea behind the Pathfinder Pawns, but even with a Bestiary Boxes 1 and 2 and a few Adventure Path pawn sets, I didn't really use them that often. Most of the time I stuck to my old minis, for two main reasons. 1) A lot of the common monsters like kobolds, hobgoblins, and bugbears were poorly represented in pawns. There just weren't very many of them! 2) There wasn't a great variety of potential PC's. This box solves problem 2! This is a great set and a must own. Such a huge variety of characters from the common PC races. Plus a lot of great potential NPC's. Adding some animals is nice too. These four will give you a solid base of almost everything you need. Everything else you get after that will add variety and zest to your pawn collection. Gorgeous set of pawns for NPCs & PCs alike!!! The NPC Codex box contains a stunning selection of individual pawns that may be used for players or NPCs. At the start of every session, I pass the NPC Codex Box around and let the players choose their pawn. The players love digging thru the box almost as much as I love sorting it for NPC pawns. Combine this box with the new Inner Sea Pawn Box for the various factions and cults to have every pawn you'll need to keep your Golarion campaign running fresh for years to come! If you use miniatures and need a lot of colorful unique NPCs or PCs for your players than this is the set for you. Based on the NPC codex book, you will find all the previous artwork and more. Some double (like the guards), many don’t. All the core races are included, as well as some animals. With these alone can build an orc army, a dwarven megaforge, an eleven city, a medieval palace or a diversified metropolis. It’s short on obvious specific cultists though, so if you need to run through the head church of Zon-Kuthon, this will not be enough. Unless you want to go on these with a magnifying glass, there is no point in heavily distinguishing the races. You may have a hard time telling apart the halflings from the gnomes, but I didn’t care and just lobed them into one bag. The only real gripe I have is with the punch-out quality. If you are not careful enough, the imperfect cutout can damage the token. I had to fix a dozen tokens with glue (hence the -1 star), and even more needed their edges trimmed with scissors. So take care on your first go. A little disappointed and misrepresented. Why are there no pictures featuring mounts for the Mounted Archer, Griffon Rider, Savage Rider, ext? Can we assume the standard "preorder and if you subscribe at a later time we'll roll the preorder into the subscription" scenario? SOLD! I've been hoping for something like this! Then to quote the eloquent Sketchpad above, Sold! So how many pawn releases before we can get a Pathfinder Pawn Subscription? BTW, it looks like you have the final art for Wayne Reynolds NPC Codex. Could that be updated now so we can see it in a large image? Have the bases changed? They look square here, but circular in the Beginner Box and Bestiary Box. I am not sure about the 2 announced Adventure Path Pawn sets. Wow. Just wow. I have been wanting these to happen for so long. My only problem with these pawn sets is they are making me hate my current games for their lack of them. YES, YES,!!! (: Was wondering if perhaps the NPC's from the Rival Guide were going to be a part of this. I for one would LOVE to have them done in either plastic or cardboard! Is there an RSS feed or very basic blog where every new official Pathfinder release is shown? I kind of stumbled onto this entry last night and would be very interested in one place for all new product announcements. The store blog nor the paizo blog provide this. Am I missing something? I understanding making something new will require more work, but I guess all I am asking for is a single place so I can discover any new content announced in the Pathfinder RPG, Adventure Paths, or Gamemastery - basically all my subs. The Upcoming and NEW RSS feeds under Pathfinder RPG appear to be broken. Oh this will be so useful it's not funny, especially considering that the NPC pawns can double as PC pawns! Very much looking forward to this. The AP sets will not have bases with them. We have the final art, yes, but we won't be updating the product image until we have the final layout. The image here is a mockup; the actual bases will be round, just like the others. Hm. I may get this. Does this come with stats for the 250 npcs? Where is the artwork from? Or is that new? I've found the bug that broke these feeds. Next time we update the site, they'll work properly. WAR just keeps getting better. Is it possible to have the subscription details finalized and available for both the pawns and the comic book prior to PaizoCon? Or GenCon? For those playing along at home, these feeds should work again. This cover looks AMAZING. :O That's easily my favorite cover art from a Paizo product. I would like a poster of that. Also, I don't think it would be a bad thing to have different shaped bases, though I can understand why they would need to be uniform as well. I'm just wondering will the other iconic characters be eventually immortalized as pawns as well? I love these pawns so much! Paizo, you know just how to make me smile. Our softcovers do actually fit in the box, yes. Might want to sort that out :p I'm guessing the free PDF for RPG subscribers is no longer applicable now? EDIT: nevermind, found your answer. Still might want to clarify that contradiction quoted above. I swear, these pawns are the quickest way to have a great "minis" collection. Still might want to clarify that contradiction quoted above. Any chance you could tell me if there will be any Nagaji pawns in this set? I'd LOVE one! The NPC Codex uses only races and classes in the Core Rulebook... so, no. I'm hoping this has multiples of common humans, such as guards, bandits, thugs, etc. I know that lots of these NPCs will be able to stand in for that, but it is easier to differentiate leaders from regulars if the regulars are all uniform. If a "pawn for each race/class/gender combination" approach is taken, that would take 154 pawns to cover all of those basic possibilities. That would eat into more than half of the total distinct pawns presented in this box. Crossover appeal between pawns eats into that of course. I remember seeing examples in the Beginner's Box pawns that had me thinking they'd be great for other classes. With all the various NPCs getting art in this, hopefully there should be some appropriate art folks would like to use for each combo. Actually, in the book, most of the low-level PC-class characters are two to a page (like the wolf/dire wolf entry in the Bestiary), and it's still only one illo per page, so it works out to about 14 or 16 illos per PC class (spellcasters take up more room and switch to a one-per-page format sooner than non-spellcasters do), which means not as many of the illos are "eaten up" by PC classes. I've talked to Andrew about the possibility of multiples of guards and such, and he'd like to make that happen, and in an optimal situation it certainly can happen, but the product isn't finished yet so we can't make any guarantees at this point.